The case of Noel Goldsbury, the only member of the Society of Friends (usually referred to as Quakers) to be imprisoned in Canterbury as a religious objector, caused a great stir in Christchurch because of the decision taken by his employer to grant him leave of absence while he was imprisoned. A majority on the board of the Christchurch Technical College, where Noel Goldsbury was employed as secretary, registrar and part-time teacher, evidently thought this was the right thing to do. But wider society saw things differently. The Sun called for the decision to be reversed, saying that the punishment was merited due to Noel Goldsbury's 'stupid defiance of the authorities'. A spate of letters to the editor followed. One board member resigned, the chairman wrote a defence of the board decision and Goldsbury's wife, Jennie, wrote correcting statements that had been made about her husband's case and in doing so highlighted some of the inherent problems with the act which had led to inconsistencies in the way it was interpreted. The case did not rest here. Local bodies, the Canterbury School Committee's Association and even the Agricultural and Pastoral Society discussed the issue at their next meeting, and several of the organisations that made grants to the Technical College decided to withhold their funds for as long as the college held open Noel Goldsbury's position. At the meeting of the Christchurch City Council there was a notice of motion to remove Councillor Ada Wells from the Board where she sat as a council representative. 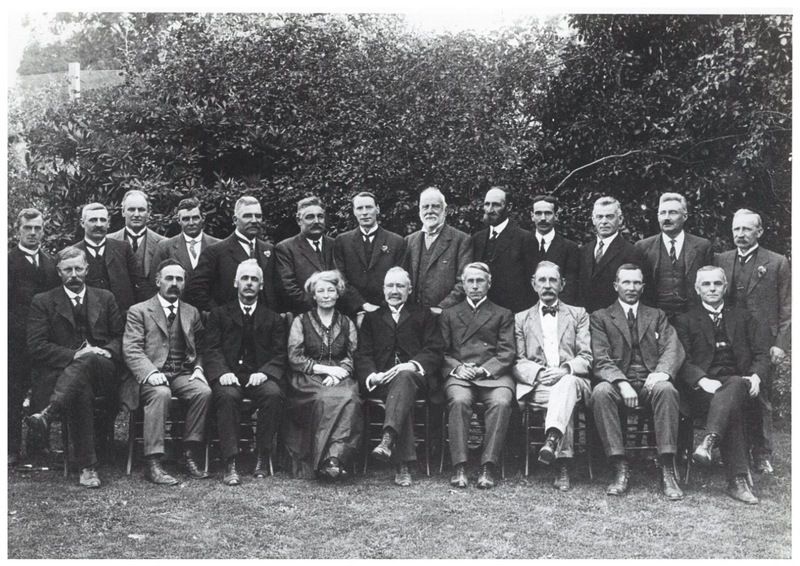 The board of the Christchurch Technical College in1917. John Howell, Director of the College, is seated fourth from the right. Board members included well-known anti-militarists Ada Wells and Henry Worrall. When the Technical College Board met in November 1918 it rescinded the motion passed at the previous meeting approving Goldsbury's leave of absence, with just four voting against this decision. Ada Wells and Henry Worrall spoke in defence of Goldsbury but were minority voices. At the same time the meeting learned that Noel Goldsbury had tendered his resignation and the chairman G. Scott also offered to resign at the following meeting. This was still not the end of the matter however. In January 1919 the Canterbury Chamber of Commerce withdrew its support from the Technical College and its representative on the Board resigned. Noel Goldsbury came from a leading Quaker family. Born at Karioitahi, Auckland in 1884 he was one of eight children of Alfred and Margaret Goldsbury. Alfred was a school teacher who had attended the Friends' School in Croydon, England. 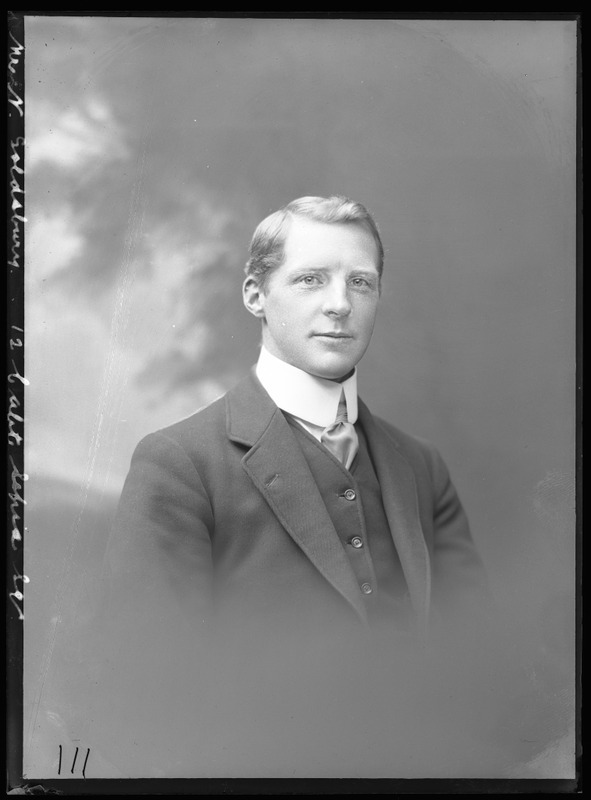 Alfred worked hard to get a Friends' School established in New Zealand and also made a significant contribution as clerk of the General Meeting for ten years from 1912 to 1922. Noel Goldsbury had represented Canterbury at hockey and his wedding in 1914 to Jennie Hamilton was reported in detail in the local press. Her costume, veil, flowers, and the costumes of the four bridesmaids were all glowingly described as was the reception held in St Matthew's schoolroom after the service. No one present on this happy occasion could have foreseen that just four years later Noel Goldsbury's name would be splashed across the newspapers as 'the Goldsbury Case' wended its way through the military system. Adherence to the teachings of Christ should raise His followers to a plane where the boundaries of nationality do not exist, but where all who profess His name, to whatever nation they may belong, have only one interest to serve – the promotion of the building of the City of God. With that supreme loyalty, the claims of no lesser loyalty can conflict – neither loyalty to family, nor friends, nor state. Noel Goldsbury was the only Quaker in Christchurch to be imprisoned but only after a clerical bungle delayed his case. First his appeal was mistakenly dismissed, then he was recorded as a reservist who had been medically classified as C2, and whose appeal had therefore been adjourned sine die. In fact Goldsbury had not been medically examined. When he appeared before the Military Board in July 1918 he was ordered to have a medical examination within ten days. Goldsbury's response was that he would not because it was a military order that he should be examined. 'These fellows are all mad, I think', was the conclusion of the chairman of the board, the stipendiary magistrate Mr H.W. Bishop. In September Noel Goldsbury was arrested by the civil police on a charge under the Military Service Act, that of refusing to obey the lawful command of a superior officer by failing to parade for a medical examination. A few days later he was one of three men charged before a District Court Martial presided over by Major A.E. Loach, Major C.V. Leeming, and Captain F.P. Osmond-Smith. Captain H.G. Livingstone conducted the prosecution. Goldsbury said he objected to being tried by court-martial and refused to plead. He refused to give evidence on oath but proceeded to cross examine Captain Livingstone about the procedures that had been followed by the Military Board. When the Court Martial resumed the following day there was a further exchange about procedural issues, as Noel Goldsbury sought to call witnesses for his appeal. His claim was that arrests should not be made while appeals were pending and that another objector had been released because he had been arrested while his appeal was pending. He asked to be heard by a final appeal board, but instead was found guilty of the offence. His sentence for not obeying orders to have a medical examination was 11 months imprisonment with hard labour which he served at Paparua Prison. Following the war Noel Goldsbury worked for Ivory Brothers, distributors of orchard supplies, and then became an apple grower at Loburn. His fruit was highly prized at the Christchurch markets. He was remembered as 'a man of fine appearance, of kindly character and always straightforward and honest in all his dealings'. From the statement issued by the New Zealand Society of Friends in 1915, Margaret West and Ruth Fawell, The Story of New Zealand Quakerism 1842 – 1972, ([Auckland]: New Zealand Yearly Meeting of the Religious Society of Friends, 1973), p.63. 'A Curious Decision', Sun, 5 October, 1918. p.8. 'Letter to the Editor', Sun, 7 October 1918, p.4. 'The Goldsbury Case: Criticism of the Board', Sun, 8 October 1918. p.3; The Goldsbury Case: Board taken to task', Sun, 9 October 1918, p.9; 'The Goldsbury Case: A Protest from Spreydon', Sun, 10 October 1918, p.3; The Goldsbury Case: A Further Protest From Woolston Borough Council', Sun, 15 October 1918, p.8; Waimairi's Representative Explains his Position', Sun, 15 October 1918, p.8; 'The Goldsbury Case Discussed by School Committee men', Sun 25 October 1918, p.7. 'Goldsbury Case: Motion Rescinded', Sun, 2 November 1918, p.10. 'The Technical College: Goldsbury Case Again', Sun, 14 January 1919, p.5. Christchurch City Libraries Church Registers Index; Audrey Brodie and James Brodie, Keeping Track: Quakers in Nineteenth Century New Zealand, (Wellington: Beechtree Press, 1999) pp.55,59; Margaret West and Audrey Brodie, Remembrance of Friends Past, (Wellington: Beechtree Press, 1999), pp.77-78; West and Fawell, The Story of New Zealand Quakerism 1842 – 1972, p.45. 'Weddings', Sun, 15 April 1914, p.4; Local and General', Sun, 2 September, 1918, p.9. West and Fawell, The Story of New Zealand Quakerism 1842 – 1972, p.63. The C2 classification meant the conscriptee was 'permanently unfit for active service but fit for service within New Zealand'. Baker, Paul, King and Country Call: New Zealanders, Conscription and the Great War (Auckland: Auckland University Press, 1988), p.111. 'Military Service: Appeals from the Ballot', Sun, 10 July 1918, p.3; 'A Determined “C.O.”: Refuses to be examined', Sun, 22 July 1918, p.9. 'Local and General', Sun, 2 September, 1918, p.9. 'Courts-Martial: Three Objectors Tried: Refusal to Obey Commands', Sun, 6 September 1918, p.9. 'Court-Martial: Goldsbury's Case', Sun, 7 September 1918, p.2. 'Eleven Months: Noel Goldsbury Sentenced', Sun, 10 September 1918, p.4. West and Brodie, Remembrance of Friends Past, p.78.